The 1969 champion Mike Eyerly stayed in FB for 1970 and this time completely dominated the season with eight wins and three second places from 13 races in Fred Opert's Chevron B17B. Allan Lader, in an Opert-run Brabham BT29 was equally far ahead of the rest with two wins to add to the five times that he finished second to Eyerly. Third was Jacques Couture in the mysterious Lotus "69B" that does not appear in Lotus records and may be a F2-style upgrade to his Lotus 59B. He recorded two back-to-back wins in the summer but retired too often to be a contender for overall honours. The Chevron B17B and Lotus 69B were almost one-offs in the series with most drivers opting for the proven Brabham BT29. Future SCCA boss Nick Craw was fourth in the series in another Opert BT29 and Matt Spitzley was fifth in his private version. Three of the seven SCCA Divisions (see right) were also won by BT29s. Brian Nelson, visiting from Northern Ireland in the Crosslé 18F, won the other race the season finale at Sebring in October. A big non-championship event at Road America in August was also won by the unstoppable Eyerly. Fred Opert regarded Eyerly as one of the best drivers he ever worked with but his career floundered when he went to the 1971 Tasman series with a badly-prepared Surtees TS8 F5000 car and ran out of finance. He only raced a few more times in FB. 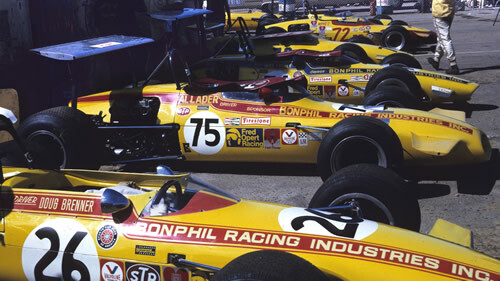 The 1970 season saw a huge change in the use of engines. At the start of the season, the Vegantune engine was the dominant engine and was being supplied as standard by Brabham, March and others but during the course of the year, Brian Hart's engines completely took over and by the autumn, all the leading runners were using Harts. Both engines were of course variants on the Ford twin-cam engine, originally developed by Lotus. The trigger for the change was, as so often in Formula B, Fred Opert. Until Jan 1970, Opert had been the importer for Vegantune but he changed camps to Hart so all new Brabham and Chevron FBs would come fitted with Harts. The $3,195 new Hart 416B was rated at 180bhp, only slightly more than the 1969 Vegantune FLC but by June, Opert was referring to the older engine in his adverts as "Vaguelytuned". Such was the split from Vegantune that by the end of 1970 Opert was announcing that Vegantune engines he was taking in part exchange were too unreliable to be resold and were being broken up instead. Skip Barber had a dreadful time in the Pro series in his Tecno FB but qualified for the Runoffs in November and won from Noyes' Brabham. The results here have been compiled by using reports from the weekly US newspaper Competition Press & Autoweek plus entry lists from race programs where available. The results are complete but qualifying times are rarely known and entry numbers are missing for eight of the 14 races. Please get in touch if you have any programs from these races.